I knew I would be setting myself up for a challenge when I chose Koyaanisqatsi as one of my films to review for Criterion Month. After all, how do you review a movie with no dialogue, no story, and no explicit narrative other than what you choose to glean from its vast and beautiful images? Well, I suppose it brings up the question of what constitutes good film writing. And I suppose Koyaanisqatsi would be thought of as a hard film to write about because a lot of film writing typically concerns plot or story, of which Koyaanisqatsi has none. But I often feel like a lot of the best film writing (or really any writing about art) is about how a movie makes you feel. And there’s plenty to feel while watching Koyaanisqatsi. The film opens on a pictograph painted on a dusty wall in Horseshoe Canyon, Utah (a visual bookend that was suggested by producer Francis Ford Coppola), as the soundtrack blares this imposing choir of Philip Glass’s score juxtaposed with tribal chanting of the movie’s title. Then from there, we see images of the Apollo 11 launch before seeing lots of sprawling and often time-lapsed images of oceans, canyons, et cetera. Then after dwelling on these more nature-based images, the film shows a mining truck, followed by images of atomic bombs, cityscapes, machinery, buildings, and all sorts of other man-made wonders. The point is, the film starts off showing the marvels of nature, and then proceeds to show us the marvels of man and technology, without ever definitively making the point that man’s exploitation of the planet is necessarily a bad thing, it’s just a fact of life. 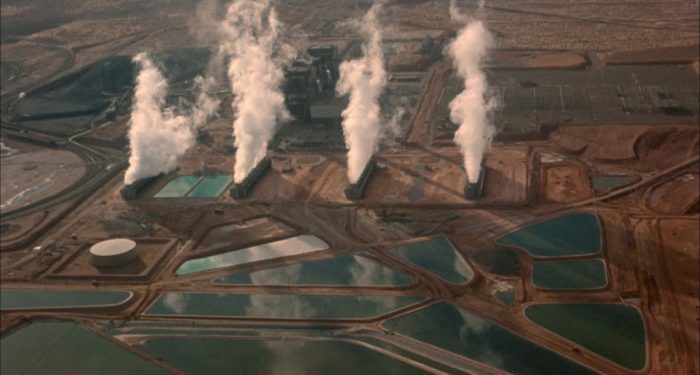 Koyaanisqatsi is the kind of film where you can kind of let your mind wander in and out of any sort of distinct meaning, while your eyes feast on these gorgeous images. I have to wonder how much of the visuals are trying to say anything, or whether they were just meant to look nice on a big screen. Especially since from what I could gather, when director Godfrey Reggio and cinematographer Ron Fricke set out to shoot Koyaanisqatsi, Fricke describes that their intent was originally to do nothing other than shoot whatever they thought would “look good on film”. Still, by shooting all of these different wide, gorgeous, often over-energized shots of cities and people and man’s most impressive creations, there does seem to be a thematic throughline. And that throughline seems to be “wow, look where civilization is right now”. Some of the imagery feels very indicative of America in the late 70s/early 80s. But at the same time, as we watch these fast-forwarded images of large swaths of people going to work, walking the streets, and following their own little mousetrails, you can’t help but stop and wonder whether you’re just doing the same exact thing everyday, and whether you’re just another meaningless spec taking up space. Again, I don’t know if that’s what the movie’s trying to get you to think about, but the open-endedness leaves plenty of room for it to happen. Much of this, of course, has to do with the strikingness of Reggio and Fricke’s visuals, but a lot of it also has to do with Phillip Glass’s score. Glass is a composer who I’ve never been sure whether it’s cool to like or not, but maybe it doesn’t matter. Because his score here is something quite amazing. It goes from minimalism to maximalism in these waves, while the stimulation of the images does as well. The film does a great job of feeling like this cinematic experience, but while also having the peaks and valleys that you’d expect in a more conventional, story-driven film. But more than anything, I kinda wish I’d been high watching this movie. I have to imagine that a big chunk of this movie’s cult following are people who like to smoke weed and let its images waft over them. Though I don’t think that takes anything away from how the film is experienced without the aid of recreational drugs. 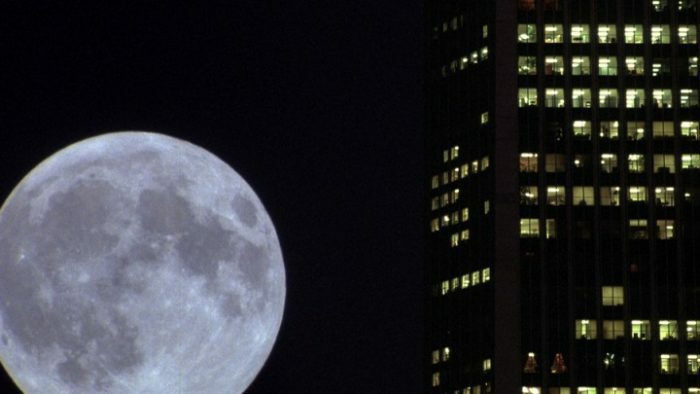 However you choose to watch Koyaanisqatsi, it’s quite a thing to behold, and just kind of amazing that they attempted to make a film of its nature before HD cameras and HD televisions. While at the same time, none of that dilutes its ability to take mere images and music and the imposing imagery of everyday life, and turn it into something awe-inspiring.